The medieval St Leonard’s Church dates mainly from the 15th century, although there are traces of much earlier work. 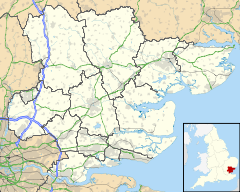 It is a relatively large, “townish” church by Essex standards. 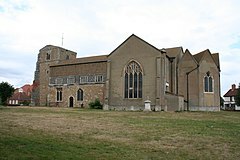 The church also stands at an important road junction, contrasting with the familiar Essex pattern of a church and manor house complex on the same site. These features are consistent with John Blair’s formulation of an Anglo-Saxon minster, in contrast to a private oratory in its origins, and the place-name would perhaps suggest Cedd‘s mission at the Chapel of St Peter-on-the-Wall near Bradwell (to the north) as its parent. Several well-known clergymen are associated with the church, including naturalist Walter Henry Hill, curate from 1832 to 1839, and Alexander John Scott, rector 1805 to 1840 but previously personal chaplain to Horatio Nelson. After the Battle of Trafalgar Nelson died in the arms of Scott, and several artefacts that once belonged to Scott are found in the church. The church also gives its name to the town’s local football team, Southminster St. Leonards F.C. The town has an infant and a primary school, a small library, a handful of pubs, a police station, a swimming pool, a brewery and cidery and one holiday park. Southminster railway station, the terminus of a single-line branch that was electrified in the 1980s, provides services to Wickford and Liverpool Street station in the City of London. Southminster is the location featured in An Episode of Cathedral History by M.R. James published in A Thin Ghost and Others, his third collection of Ghost Stories published in 1919. ^ “Town/Ward population 2011”. Retrieved 22 September 2015.